BBC sounds music Radio podcasts, this is the media show from BBC Radio 4 know that one of my New Year's resolutions is to ensure that any reference we make on the show to Netflix is tempered by a reminder that watching live on good old Terrestrial TV is still more popular than streaming in this country for the time being at least and today we're joined by The Woman Behind the Nation's most popular drama Dame Pippa Harris is the co-founder of Neal Street Productions and is the executive producer of call the midwife Pippa you also chair of BAFTA and will ask about that role and your plans a bit later on but before that a little birdie told me that when you first to call the midwife to the BBC they weren't convinced that the truth. I don't want to get anyone into trouble but I think the combination of gynecology and cycling nuns. Maybe they thought that can be a bit of a niche area but but actually after about. Six to nine months we convinced them and that was 8 years ago now and have a look back ok cuz supervet midwife actually into our living rooms on his Sunday night is partly the responsibility of Jonathan Thompson Jonathan is the CEO of digital UK which is the body that looks after Freeview and our guest don't often include people that you who run bits of the technical infrastructure to the media after your task today is to be exceptionally interesting ensure you out for that. Can you tell me an interesting fact about TV aerials? I was in Las Vegas couple of weeks ago for the Consumer Electronics show and I got an email which was the 10 biggest brother you new things at CES and one of them in America would buy an aerial really the new exciting way of getting television for free in America with fascinating so is the Cutting Edge of technology watching to you video of your own, so she will be stacking up and stocking up on our old is Keira Knightley worth a fortune. Hey Julian is radio critic for the Sunday Times previously the Daily Telegraph at gilling you can listen to your radio via your Freeview TV all you can get one of these new smart speakers and chords. So what does the Nation's preeminent radio critic actually listen on I have a radio session every room I sometimes put the television on because the sound is better to listen to some radio programmes. I listen to radio through a lot through my television at could you get this great big orchestral Samsung I'm well supplied with radio set your multi-platform. It was good to see you Gillian welcome to all of your thanks for your time at first. It's one of the biggest questions for the media industry, who is responsible for content online for the people who post it there all the companies who provide the platforms many of you will have seen a horrifying story leading news bulletins and front pages over the past 24. Hours is the story of Molly Russell a 14-year-old who took her own life after extensive exposure to images and videos of self-harm on Instagram Instagram said it does. Not allowed content that promotes or glorify self-harm or suicide and will remove content of this kind, but Marley's father says some of the material that Molly sorting Instagram romanticizes self-harm and suicide and the Instagram helped kill his daughter when is Graham's home by Facebook and this morning I spoke to Steve Hatch Facebook vice president for northern Europe and I asked him if he would let his own children go on Instagram I would allow white children's go onto Instagram at the right age because there's a 13 of for Instagram because what I see an Instagram is an environment that is supportive. It is creative and equally as well as we know. We've always got to work harder to take down the wrong kind of images which some for some of these may well be but it's very hard Mr hatch for anyone listening to you to reconcile what we know we can find on Instagram with what you say instagrams policies the fact is daily mails reprinted something today. There's a picture of some slit wrists at from Instagram there's a picture full of blood that from Instagram there's a picture with a young girl to cartoon young girl hugging a teddy bear saying this world is so cruel and I don't want to see any make sure that we look at these and ensure that those people with pictures of slit wrists which 14-year-olds can access if people are posting in order to seek help and order to seek support from Communities the experts in this area tell us that is a valuable thing for them to do an attack and help with recovery it can help with support if it's thereto since I think I might of course as no place and I'll purple it shouldn't be on about 4 when we need to work hard to make sure it's not a platform that would certainly well well. You can see more of that interview on the 6:00 news on BBC one, but we're making the full interview available on our podcast search for the media show on BBC sounds and you. Describe there this week has been a big one for developments in the world of radio the most surprising being on Monday went Bauer Media the conglomerate behind magic absolute and kiss and Elsa it had hired Simon Mayo radio 2 drivetime start until late last year to present a show on a brand new radio station scala radio is described as a classical entertainment radio station and it will launch on digital in March classical musical. Sorry classical music fans already have Radio 3 and classic FM so is there a market for another Steve Parkinson is the managing director of Bowers national radio stations in the UK and earlier? I asked him what the business case for Scarlett is when you think about it. There are 250 rock and pop stations in the UK doing a pretty good job from a business point of view and there are only two classical services in the UK there are 17 million classical fans in the UK so you only have two services. Seems a little bit out of kilter with what else is on offer so we think there's a good opportunity to do something different classic gap in the market territory Simon Mayo is your big name signing at what's the logic for putting him on at lunch time when all the answers are traditionally lower than at Pete's lots of breakfast and drivetime good question I think in talking with him. We can see there's quite a tuna around moment at 9 10 when people come out of the Today programme LBC does there's a move does a shift in the behaviours to radio listeners and I think looking at some of the classical listening patterns there. There's a lot of people that listen during the day whether that's at work or at home. So we're actually going to create a breakfast show environment in the mid-morning which we think has a better chance of growing a bigger share more quickly by playing that music and having that intriguing conversation at that time of day with iggle offer something new is billed as a classical music. Station bit is Simon Mayo show actually going to have a lot more chat and be quite an attractive proposition for Radio 4 listeners. I think when we started out with this rather than it being a classical radio station that plays classical music that's all about the other two stations do so I think we said this is almost there if Radio 2 did classical. What would it be for this is a full-service radio station that happens to play great classical music with Simon I think because he can bring that intriguing conversation and tell some of the stories behind the music that that's gonna sort of create create the magic so I think that me Spot the Difference what do you success look like this car that would fit in and Away how many this is to anticipate the station having after 12 months so I think we're not going to talk numbers at this stage of business cases work and our planning works. You must have a projection. Numbers for 20% of a radio too so what do you need to be 15% this well as I think we will see this is about making the connection in a modern life with the people who is slightly younger than light classical music so if the average age of the competitors might be said of in the late 50s were talking in the late 40s and early 50s because the the target audience was spoken to just feel that there's nothing out there that they can they're tune to for that mix of familiar Masters but also that's of a sense of surprise a new music Discovery how much is going to cost you in year one again being part of our a private company we won't go into that but let's say there's a sizable investment in you know. Peanut man with you get 10% or 15% of the audience of a journalist knowing perfectly well, is it any going to be broadcasting on DAB and it's going to be an uphill struggle for that so technically astute observation deliver to precisely why we ask you to the studio The premise of this new station's car radios quite attractive. Do you think it'll work they must have said the crowded with pop you never said yes, it is good. They must have researcher quite. Have you borrow or a big and powerful force in the broadcasting world in Europe as well as in now the UK and they must know this is market day, but these are the young listeners. Who are looking for they call them the experience economy in other words that looking for people who go out and when he mentioned events. Today promising to set the world alight with this new brand of new and exciting music very shrewd appointments Simon mayos an exceptional broadcast it was Tony award speech broadcast of the year, but they've also brought in a program manager from classic casual worker classic FM very good producer and they brought in very handy the BBC's former digital editor, Brett Spencer who was in charge of Radio 1 1 Xtra 6 Music significantly 2004a da to pop up and you think Radio 4 might end up losing listeners to Scala don't want to hear about brexit or about gender economy. I said he was big news big news week in radio on the subject Radio 4 controller Gwyneth Williams analysis we that she'll be stepping down. What's the big Challenge for her replacement? Are obeying the will of James Purnell who is the director of radio who makes all the policy decisions and I think he has his own vision of what Radio 4 should be and whoever coincides with the addition will get the job to do eyebrows go suddenly notice. I didn't realise that the BBC I'm chilling you noticed. I'm sure the Enormous publicity push the BBC is given to its new BBC sounds that is the basis of BBC's response to Spotify and its attempt to catch the Drift of younger. This is away from live Radio 2 on demand. It was just heard from commercial radio boss talking about the launch of a new live station at News UK is investing massively in live radio Chris Evans start of this week in Burton the dancing to be a tremendous buzz about British radio at the moment. Why is it happening now? It's not just happening now 4 years. We've had a 90% listenership. No, nobody would have thought that either. 10 years ago, they would say that the more radio station to get the more it would dissipate the listenership and son no radios very strong and healthy in this country mostly because is rough parity between the two segments commercial radio does things BBC can't do LBC presenters who voiced political opinions and that very attractive in one way BBC can do things the commercial radio could never afford to do the BBC Sport 5 orchestras commercial radio doesn't do that scholar by the way, I've had that idents done by the city of Prague Symphony Orchestra they might have booked a British band, but mine has the BBC god it's stretchy right at the moment well. It's hard to say because they push seems to be towards winning us away from networks and into solely online DAB and someone that's difficult because the internet and all of that side of. Doesn't reach quite a significant segment of the population I hope for rent in London who can't get an internet signal Gazette houses surrounded by trees, but I have friends in the latest I have the slowest speed in the world to until we've got really stronger penetration. It's a very dafabet to go slowly towards something that's online and streamed it's interesting because we're about to talk TV with Jonathan where on-demand viewing makes up a very significant percentage of the hours that people watch. It's just not the same with radio. Is it? What is it about radio? What is about the intimacy of the magic whatever you what? Is it about radio that makes people so want it live the company you feel they're in the same room with you you feel I feel listening to you. I want to teach you now. Don't your voice at the end of centre tomorrow with you now and everybody knows Romanians and it that feeling. Very particular feeling is something only radio gifts love very grateful for your constructive criticism as are all the people who felt the 10th of your pen as you mention Gillian technologies + huge number of ways of listening to Radio the same as truth cost of TV only lads club Jonathan Thompson CEO of just UK the body at that looks after Freeview as being from the world of traditional TV viewing at times slightly in each other than a bit unfair because I was in you want to tell us about the new app that Freeview has launched this week at this is your moment in the Sun tell us. What is it ok? We launched a new mobile application and yesterday initially on Apple products on iPhones and iPads that will be launching an Android version in March and Innocence what the application does it say it's a free application what it does is to send it sent replicate and allow you to have the experience to have on a Freeview television on your mobile phone. So if you don't like the app you can browse across the traditional TV guide to look at what's on their what's coming up and also catch up on programs that been on over the last 7 days if you know what you want to watch you can search for the program title. Find it and go straight to watch it or if you're looking just a browse and find something you haven't heard of it before we make some recommendations by John Rutter example in drama. We list the the top 10 dramas to watch now which I'm thankful just checked on application areas so it's a really is to do with 3 views always done which is to aggregate the best free to a television and make it simple and easy for the viewer to find what they want to watch Scooby sky launched a mobile phone app for their channel is the best part of a decade ago. Why is it taking you so long? So I don't think it is late. I mean I think all of all of the broadcasters have experimented of a looked at the ways in which they can watch consumer providing to consume content on mobile devices when we talk to view as they the frustration they had is you can dip into individual applications from the BBC or iTV or whatever people do what they wanted with the television experience. They want to build brands across programs from the BBC bromans on my TV programmes from Channel 4 all in one place. They wanted to express their head on ITV on their mobile phone and that's exactly what we tried to do. This mobile application and it is the first time you've been able to do that for free in one place across both live and on-demand content so it is a first for us and for the black paper Harris who took too long on this show about the editorial innovation at the moment the new forms of storytelling with a talk too much about the distribution is Siri how do you as a top producer respond to the launch of a new app like this try to make it easy for people to get TV it's great. I totally agree with what you're saying that the difficulty in the past has been that you you can go into maybe iPlayer or or or or another provider, but what you as a consumer want is to be able to see everything on off at you. You want to be able to see all the dramas that are out there. I mean I think the thing that's interesting for us because we get our figures broken down at the moment. So we can see how many people watch Call the Midwife on TV how many watch on a tablet or a PC and for us the tablet PC phone segment is relatively small as a percentage of the overall viewership. Think of you look at shows like Eastenders it makes up a much bigger. Chunk of their viewership which is sort of logical. I I think as a viewer I I could dip in and watch half an hour on my phone. Not sure I really want to sit down and watch an hour-long program on a telephone but but maybe that would just change or maybe that's an age thing you're very old was don't pay for an additional TV package on top of licence fee seemingly get a raw deal when it comes to new technology, so if you buy a new TV today the chances are it will be a 4K one at Ultra high-definition great picture quality, but you can't watch anything 4K unless you pay for it from Netflix or Sky or Virgin shouldn't Freeview Freeview be offering that kind of thing well and that we have had 4K content on Freeview 32 Play devices and the BBC did the World Cup in 4K last year and we hope to see more content from from the BBC to see you. Hopefully from other brokers to serve you as always been a we just want the fast follower. We're not there to be at the leading edge of technology innovation. Most employees to make TV really simple and easy for the mass market, but the same time we absolutely need to adapt and develop to respond to technological changes. That's why he wants Freeview play 3 years ago and that's why I will do the mobile app now, so yeah, we need to I need to keep pace with technology, but I'm not sure whether to come over be the true innovators. I think we need to make it popular for the mass market. How long before the TV aerial on a roof is completely redundant. I think I I get asked out my crush and a lot and I think it is far further away than most people think that is what the light what the lies that question is, when will we all be able to watch television over the internet and if you look at the facts tempted to the country don't even have broadband. I'm sure many of your listeners. Get round table, isn't it? Because you can't move mountains the mountains and trees and things block signals. Is it? It's a long road to here. I'll get round but I think that's the first time. I've heard that word and immediately in my time. Thank you very much it. I love you bring Andy Pippa Harris on this very point co-founded Neal Street Productions with some film guy called what's his name Sam Mendes is it yeah? That's the company behind dramas like call the midwife penny dreadful and informer also chair BAFTA the British Academy of Film and Television arts at people in the US who similar question how close do you think we are to the end of its use the phrase but we have to Linear TV as in how many years until the whole idea of a TV channel makes no sense different questions really I mean in terms of how how far. We are away from getting rid of TV itself out. I think we're with decades away. You know I'm not sure that will never happen. I think for me what's interesting at the moment is the sort of overlap that's going on between. Film and Television so that for instance this year you seen in the baftas and the Oscars that Roma has been nominated as best film which of course is a Netflix film so that most people are only ever going to experience that film on their televisions because it was in the cinemas here for a very short period of time but that's certainly hasn't deterred people and it hasn't heard people from voting for it is the best film and it's incredibly cinematic piece if you if you seen it, so this this this this melding that's going on at the moment between film and television and the internet all of them coming together and coming apart at different in different ways obviously production companies like yours are doing very well out of the huge demand now is for TV shows from the likes of Netflix is there a downside to work if these companies in terms of ownership of rights in particular. Independent producers point of view is that you retain the IP in your own your programs so if we make call the midwife we are given a licence fee by the BBC and they are allowed to broadcast in the UK but then we can sell it around the world so we can benefit as can the creators of the show the writer the people involved Netflix have a different model where they tend to pay upfront for more money let you know there are lots of rumours about how much they pay per episode for the Crown for instance, but they don't deliver then a back-end share back to the producers and the creators of the show so it's very different model and it's you know it's arguable that actually that's not great in the long term for producers because you don't end up with her content that you own yourselves or a library of content so we talk to you about midwife your name comes up in the credits as executive producer. I'm off to mention these sorts of titles. What does an executive producer actually do. Well, it varies actually I mean in the case of call the midwife. I've found the original material which is A Memoir by Jennifer Worth took it to the BBC said I said no go away then. I went back again and eventually they put it into development then I sent the the manuscript to Heidi Thomas and said I think you should adapt those who said Heidi Thomas is the series creator and writer she also said no, I didn't say it and then she she said I'll have another read if you're really so certain and came back and said yep, you're right. I think we should do this together will be great. So then you put a team together around the Script that you've eventually had written by Heidi and off you. Go so I'm involved at every step of the way really do the master stroke with call the midwife was having Vanessa Redgrave voice because you just hear that voice and you think I am going into your world hate me. 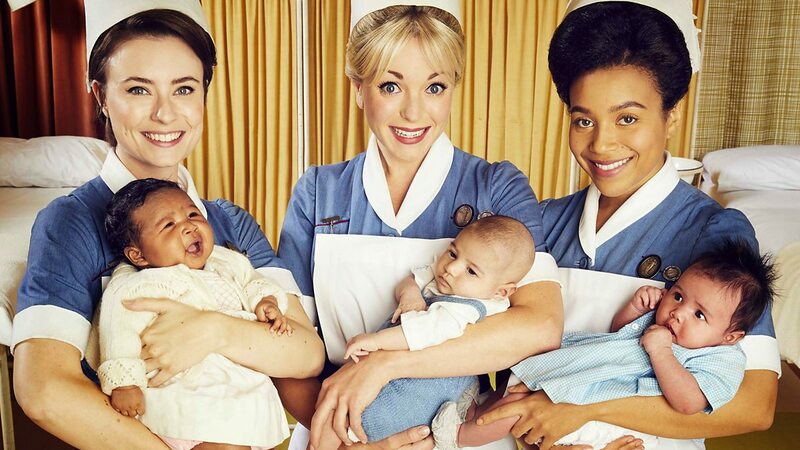 How does Call the Midwife sell around the world really really well. It's in 204 territory that I was think that's a bit confusing so not quite sure how they can be quite too many territories, but apparently that's how many there are can you imagine a world which would BBC wouldn't post call Midwife Netflix come into orbit with this different model or whoever Amazon saying give us loads of money on interest no, I don't think so, I don't think my God he's ordered more series of it, but you know how many more series been commissioned to Dave commission the next series which is serious 94 the Netflix programme which they do you should know that you're in the business when it comes to the next few I possibly, couldn't possibly loudly with your birthday. Hat on paper is a British TV industry as productive as it could be I keep reading for example that we not good enough film studios to keep up with Demand and we're losing out to those other countries you mention. I don't think we are what's interesting is since the high-end tax break came in under the coalition government few years ago via. Counter production in the UK has gone up exponentially and a lot of shows which were being shot in Prague or Budapest or Brussels wherever I have come back to the UK but as he say that has meant that the studios around don't phenomenal pressure now. It's very very difficult to find studio space with prepping a movie at the moment first world war film and been looking for studio space and it's been really really tough. So you know it's it's great in terms of the work generated the thing that I think people need to be careful about is traditionally the BBC iTV Channel 4 have all invested in Talent they've all invested in new Talent and nurturing Talent and that's something that Netflix don't necessarily need to do they can cherry pick people who are already fully developed and don't need any note showing your cherub after that gives you tremendous power. What do you intend to do with it for me? I think the the key message is that we need to diversify as an industry. It's still a you know if you look at the stats for for instance the number of women who were directing film and television in the UK it's still below what it hovers around 10% of the way we have we we almost to have an entirely female crew of directors who made the show but you know that for me. It is not right it shouldn't be that when you look at the number of graduates coming out of film school there roughly 50/50, but somehow along the way all the women drop Away and Aunt are becoming fully fledged directors Gilly we're off to talk about this so complicated idea of diversity on the show and try to explain why it is complicated. How do you feel radios doing on the same as same as you are doing really trying hard to do both gender and racial diversity and yet, you know it's it used to be a camp voice meant Julian in. Sandy it doesn't mean Julian inside the anymore it mean somebody who happens to have a camp for his talking with authority about subject, but it it it an interesting change over because I would have thought a commercial radio with really deep in here, but interestingly enough one of the other big signings on scholar is Goldie now. There's a bullet for you is ability of Django this is to let me find it just asked you most of your career has been spent making drama now. That's so much dramas made for international audiences. Do you think there's a dangerous people have BBC of all the something precious which is true local attachments is being lost at the moment. If you look at a show like The Bodyguard this year bodyguard this year at which got phenomenal viewing figures clearly local programming is alive and well. Ironic of course is that they tend to then sell very went well around the world. That's the same we call the midwife is same with Downton Abbey things which are made for UK audience then can be exported. I think where it gets dangerous is when people try to create shows that they think have international appeal and they scatter you know cast members from different nationalities through the show and tried to deal with international topics and those shows in my experience tend to be the ones that flounder Gillian Bruce was just nodding in agreement because that was very expensive BBC television series in Budapest 3 seconds in Milan and you around the world and you thought there a lorry here. I'm watching of people like Suffolk in there relating to take out for a podcast. Thank you Julia for coming in after being so kind on and off and Jonathan thanks for telling us about your new app Paper Harris from real steel production Neal Street Productions thank you to you too. We are back at the same time next week and you can also as I've mentioned of cup of tea. Find us on the BBC Sounds app, please search for the middle Show podcast and just hit subscribe.